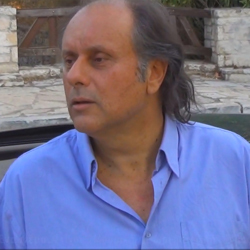 Simon Kouskounis was born in New Heraklion of Athens . From the tender age of nine he started educating in classical guitar and in Theoretical Music, in National Music School . After high school he was educated in University of Finance in Athens and specified in Computers. Besides, his love for the music remains inalterable and gains him from the finances so that he deals with the composition, the modern musical technology and sound recording. He plays the guitar on a professional level , the mandolin in a very good way and the piano only just. All by reading sheet music. Simon Also writes songs and lyrics. He is working in the hard way in the Musical Industry since 1986 and he is the owner of Room-S Recording Studios since then .In 1989 he became product specialist in Steinberg Software Company and in 1992 in J Marshall Company for the department of Greece. He has so far created 28 personal CD Albums & Compilations and many of his songs have been performed by many well known singers of Greece. He has also written many articles in a few musical magazines . Today Simon Kouskounis prepares his next personal Album while at the same time he works as Producer- Arranger in WaveMusic and Chief Engineer in the studio Room-S Recording Studios . He likes reading about the music recording business. He has a small country house at Lavrio and likes spending sometime there and taking care of his garden . He also likes sitting at his veranda , watching the sea view and listening to fine music. He is a very -very- occasional social drinker and appreciates fine cuisine. Follow me on Spotify !